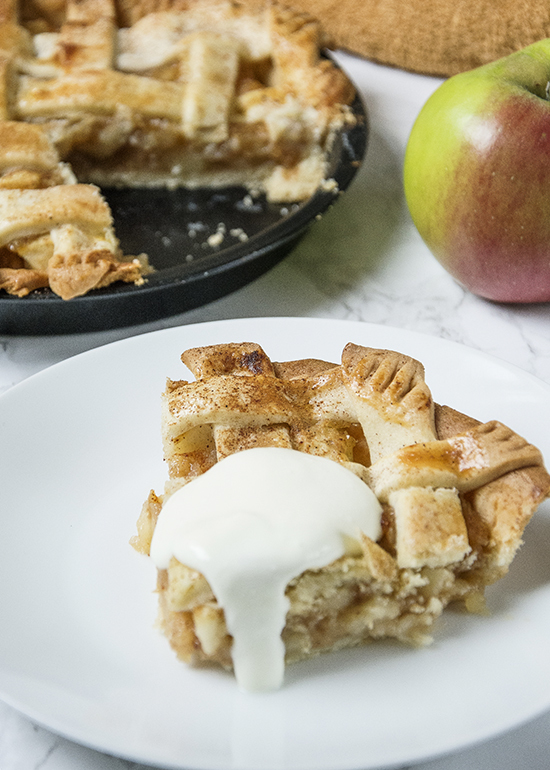 Spiced apple pie, this cinnamon-spiced homemade apple pie is easier to achieve than you think. 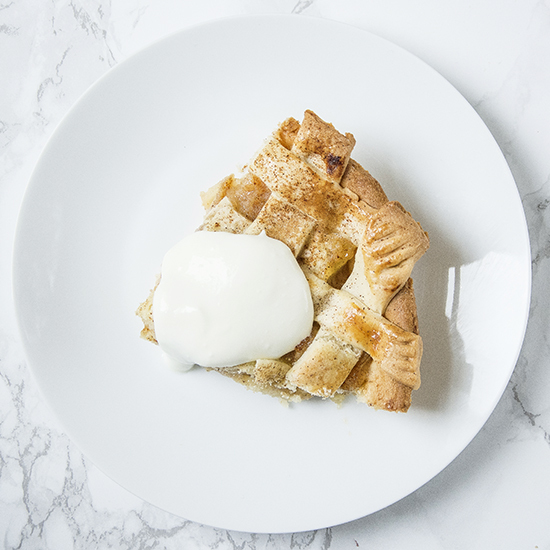 Spiced apple pie. After the great apple tree exodus of 2018, I found myself with far too many apples for one person to possibly deal with. I made apple sauce and after that, I was a bit stumped. The apples from the tree are lovely to eat raw, all be it a little tart as they are a little under ripe. But they don’t cook well, they lose their shape quite easily so you can’t get that lovely swirl on an upside down cake. So when life gives you mushy apples you make a spiced apple pie. They’res nothing wrong with using a less firm variety of apple for your baking, if that’s the only thing you have you just have to make do. 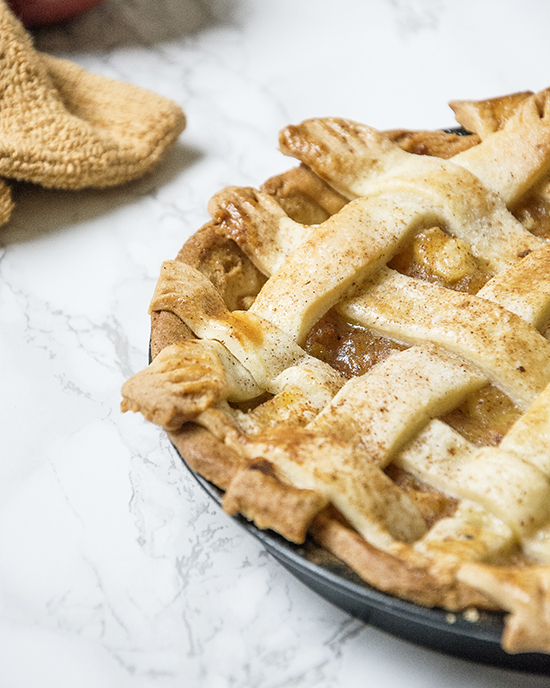 This apple pie has a very soft spiced apple filling made by first cooking the apples off in a pan whilst blind baking the pastry then when the pastry is finished adding the filling and a lattice pastry lid. I think a lattice lid suits an apple with more moisture as it allows the moisture to escape but feel free to experiment with any lid you would like. Note: I use ready rolled sweet shortcrust pastry because I was in the supermarket and it was right there and cheap if you don’t want to make your own pastry that’s perfectly ok. Making your own pastry is easy when you have the knack to it. I am planning a series on basic skills like pastry etc. Unroll your pastry out onto a floured surface, roll it around a rolling pin. Lift the pastry over the rolling pin and lower it gently into the pie dish. Trim any remaining pastry from the edges. Line the dish with parchment paper, topped with rice, dried beans or baking balls. Bake for 10 minutes. Whilst your pastry is blind baking you can peel and chop your apples into roughly 1cm chunks. Remove the pie from the oven and place onto a wire cooling rack, remove and discard the parchment paper and rice. Leave to one side whilst you prepare the filling. Melt the butter in a medium pan, adding the chopped apples, sugar, vanilla, corn flour, cinnamon and mixed spice. Cook on medium heat until the apples have softened. Once the apples have softened remove from the heat and set aside. Take your leftover pastry and roll it out on a floured surface until it is about the thickness of a pound coin, about 2mm. Cut the pastry into even strips that are the length of the pie dish and 3-4cm thick. You will need 8-10 strips. 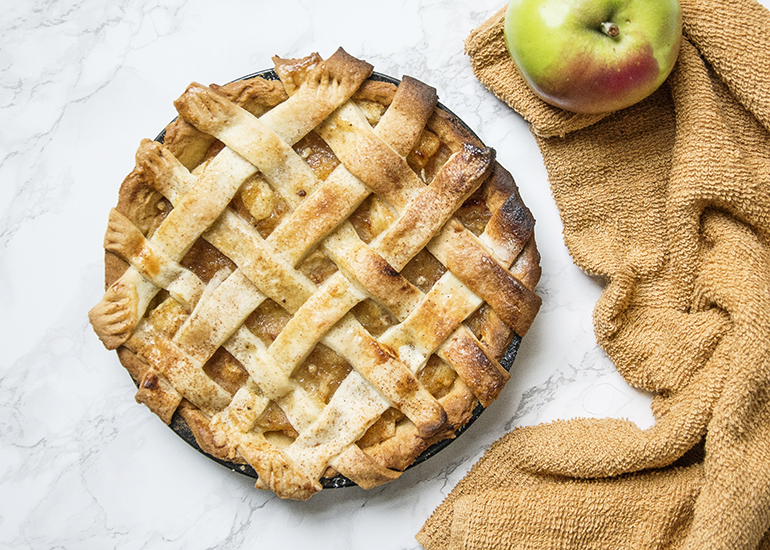 Fill the pie with the apple filling, laying the pastry strips down alternating horizontally and vertically to create a lattice effect. Brush the pastry with the beaten egg using a pastry brush and sprinkle with a bit of extra sugar. Bake in the oven for 30 minutes or until the pastry is golden brown. Serve with either ice cream, fresh cream or custard. And there you have it, the perfect way to use up any surplus apples. If you give this recipe a go let me know how it goes by tagging @whatseatingmanchester in your social media post. For more baking inspiration don’t forget to check out my blog or Pinterest.